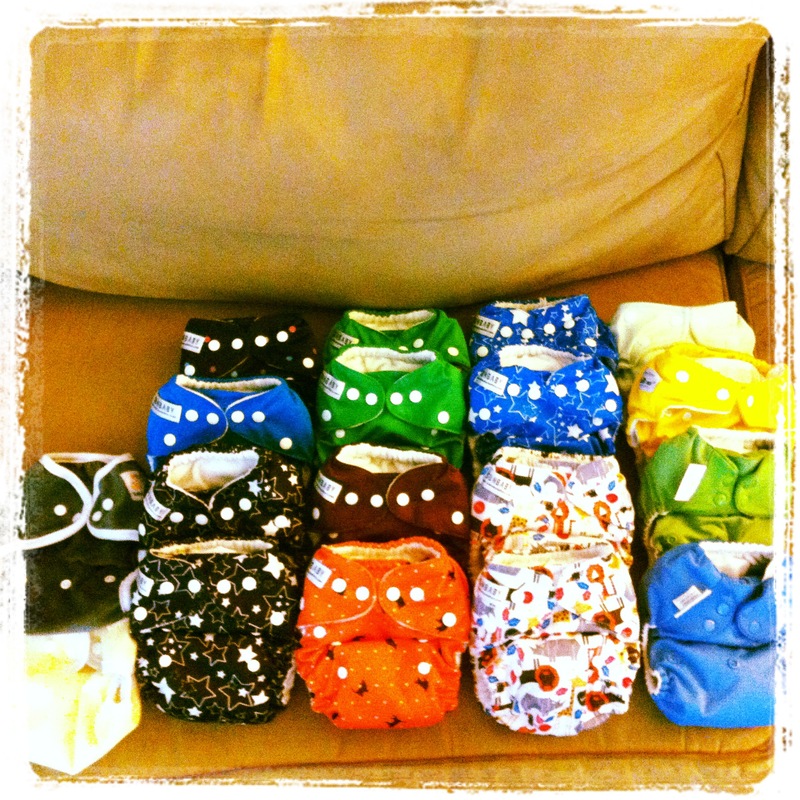 Finally, we are cloth diapering! It took almost 6 months to ditch the disposables, but at least we’ve made the leap, YAY! After much online research we decided on going the mostly pocket diaper OS (One Size) route with microfiber inserts. We also got 5-6 diaper covers and a small stash of unbleached indian cotton prefolds, bamboo/microfiber inserts, and a Snappi. In addition, we bought a hanging diaper pail with a zippered bottom to hold the wet/dirty dipes. We also purchased some hemp/cotton inserts and one bamboo insert for use when we need a little more absorbency (like naps or outings). We are still trying to research a night-time routine that will work for our little sleeper. The last item needed is a travel wet bag to put our used diapers in while on the go. I’m using plastic grocery bags right now which is not the best for leaks or for the environment. Here’s a breakdown of what we purchased with links. I had a lot of friends ask for advice and info and hopefully this will help. Disclaimer: I am by no means an expert and am only going off my online research, cloth diapering community boards, and my budget. Pocket Diapers OS (One Size adjustable) – a shell made by sewing two separate materials together (PUL and microsuede), while leaving a ‘pocket’ to stuff-in an absorbent insert. Total: 16, plus 20 microfiber inserts, 11 bamboo/microfiber inserts to serve as doublers when needed. Thirsties Hemp Inserts – total 2, this might be our overnight solution with a microfiber insert, hemp has great absorbency. Diaper Covers OS – waterproof material (typically PUL) that you place inserts, prefolds, fitted diapers, etc. into. Total: 5. I realized you need to purchase non-sandwiched PUL for it to be wipeable which is the whole point of covers. You can wipe them and reuse once the air dry. I unfortunately bought some of the sandwiched which means if they get wet I need to throw them into the wash. Live and learn. FuzziBunz Hanging Diaper Pail – holds 2-3 days worth of diapers (I do laundry every 2 days, but there’s always room). I love that it can hang on the back of a door or hook and that it has a zippered bottom so you just unzip and dump the contents and the bag into the washer. It seems very well made, holds in any odors, and received great reviews on Amazon. CJ’s Body Butter – you can’t use the conventional diaper rash creams when cloth diapering as they cause leaks and repelling issues. I found the best cream that is safe for cloth diapers, smells divine, comes in a large 8 oz tub and is safe to use on his bum and the rest of his cute self. I’ve used it on his teething rash, and I’ve even used it on my dry elbows. Can you tell I love it? Building your initial ‘stash’ of diapers can be expensive, but there are plenty of manufacturers that make good quality diaper covers, pockets, AIO’s (All-In-Ones). Assunta Store – what I love about this company is that all sales support China Little Flower, their non-profit organization caring for disabled and dying orphaned children in China. It took about 2 weeks for my package to arrive (due to customs). The diaper covers and bamboo/microfiber inserts are awesome. The minky print diaper covers are PUL (not sandwich PUL) so they are wipeable. Non-minky are not. They also have pocket diapers which I’d like to order. Their OS diapers are a little larger so I think they will last a little past 35 pounds. I love that their covers have double leg gussets to further protect from blowouts. Though come to think of it I haven’t had a single blowout since going cloth in ANY of my diapers – COOL. SunBaby – company was started by a young Mom and her husband and are manufactured under fair labor conditions. These are the pockets I purchased and I really like them. They fit Kellan well, the microsuede liner wicks moisture away from his body and soaks into the pocket stuffed with 1-2 inserts (depending on how long we go without changing – we need 1 more usually for nap time). By the way I change Kellan every 2 hours with 1 insert and can go 3 (possibly more, but haven’t tried it) with 2 inserts. I purchased the microfiber inserts here for stuffing the diapers. Note, I had to wait for 3 weeks for these to arrive from China. Kawaii – 2 covers purchased at Sweetbottoms Baby Boutique just because I heard good things about them and wanted to try them out. Again, the minky are wipeable and the non-minky are not. They have a trim fit and work well with prefolds. Shipping was fast from Sweetbottoms. If you order directly from Kawaii they are about $2 cheaper a diaper cover, but you’ll have to wait 2-3 weeks. I love, love my BumGenius Pockets. They are awesome and if I could afford to have all BG’s in my stash I would! I’ve been washing the diapers every 2 days in the evening after I put the baby to bed. They dry on low when we’re sleeping. I’ll post my wash routine soon. We have a HE top loader (Whirlpool Cabrio Platinum). My stash of 16 pockets and 5 covers (plus inserts and prefolds) has been more than enough. We tend to have 4 pockets and 2 covers left over. We spent a total of $160 for all the diapers, inserts, doublers, prefolds, hanging diaper pail, and CJ’s. Totally worth it when we were spending $45 on disposables every 2-3 weeks. It pays for itself in 2 months and we have a lot more diapering to do before K is potty trained. Speaking of potty training, I’ve read the cloth diapered babies tend to potty train sooner since they can feel the wetness. Bonus! I’m including some links to diaper websites that have a ton of great information on CD’ing. 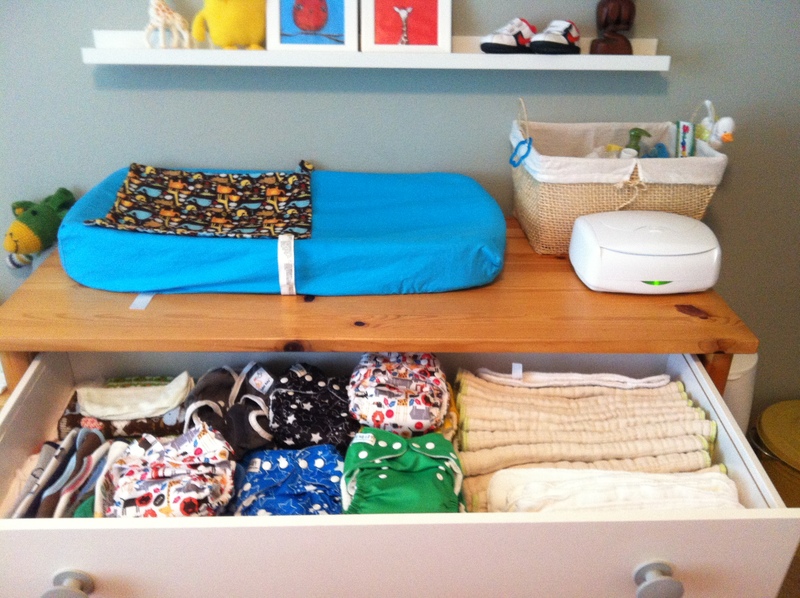 So, to sum it up cloth diapering has been a LOT easier then I thought. I love all of the adorable prints and Kellan’s bum looks so fluffy and cute, and comfortable in them. More importantly, we aren’t spending an arm and a leg on disposables and it feels great saving our landfill. Let me know if you have questions! It can be confusing to start, but hopefully this lends some insight. This entry was tagged Cloth Diapers, Fluff, Kellan. Bookmark the permalink. article. But want to remark on some general things, The site style is perfect, the articles is really nice : D.